Keep your dog or cat comfortable in a clean and healthy coat with the eXtreme dog grooming glove / cat grooming glove. The soft silicone tips remove shedding hair while providing a soothing massage and promoting healthy blood circulation. The hair sticks to the glove, but easily peels away for disposal after your grooming session. The glove is great for dry or wet use. Use it to help your dog's comfort level during bath time for an enjoyable experience for you and your pet. 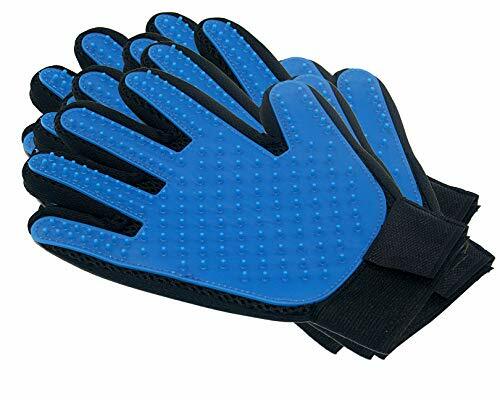 The glove is one size fits most, and has a velcro strap to ensure a good no slip fit, and a breathable mesh cloth for fast drying. Your pet will remain happy and healthy. Your home will remain tidy. Get your eXtreme Pet Deshedding Glove today!! If you have any questions about this product by Extreme Consumer Products, contact us by completing and submitting the form below. If you are looking for a specif part number, please include it with your message.